Guests at the Queen's Head may park in the car park at the rear of the pub for up to 12 hours when they have made a purchase and registered their car on the ipad at the bar. The car park is monitored by ANPR cameras which photograph the car registration at any time of day or night when a car enters or leaves the car park. If the owner or driver has failed to register at the bar when making a purchase, a parking charge notice for £100.00 is sent by the parking company during the following week. Please note that we have handed over full responsiubility for the management of the car park to Premier Parking Ltd. The Queen's Head has a contractual agreement with this company, and cannot in any way get involved in parking disputes or queries about parking tickets. The signs in the car park make this perfectly clear. When you enter our car park, you are entering into an agreement with Premier Parking Ltd and not the Queen's Head. It was necessary for the Queen's Head to enter this type of agreement in order to deter commuter parking and other abuses which detract from our proper business of running the pub. 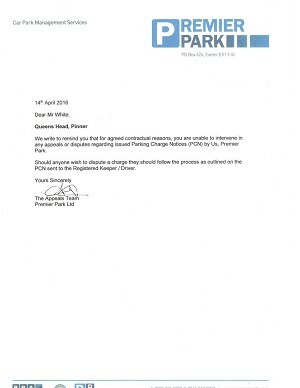 As indicated on the letter below, and the numerous signs in the car park, the Queen's Head cannot under any circumstances get involved in parking disputes or parking queries, and our staff have been instructed not to accept parking tickets or any other correspondence regarding parking. Please note the Queen's Head does not earn a single penny from its arrangement with Premier Park Ltd. We do however pay rent, business rates and maintainance costs associated with the car park.